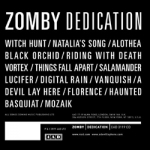 Currently enjoying the latest LP Dedication from Zomby. It's been out a while now, but it definitely suited to dark evenings or early hours. This track a nice moody film score vibe, the tinkling synth sounds are reminiscent of some old seventies film soundtracks by the likes of Francis Lai, Lao Schifrin, John Barry and Nino Rota, but with a Zomby twist. A far departure from his earlier ravey stuff this is a step into Burial territory with exquisite results. Recommended.